Tula Rashi 2015 predictions forecast a bitter sweet year, but overall it will turn out to be a good year. Your decisions will be based on your good judgment. Chances for the Libra zodiac sign people of having their own residence and luxury vehicle are bright during the second half. You will be lucky in property matters provided you take prompt decisions. Career horoscope forecasts by Thula Rashiphal 2015 foretell of a good second half of the year for both professionals and businessmen. You will start new projects and they will yield good profits. Professionals will make progress in career with promotions and increments. 2015 Bhavishya Rashi for Tula Rashi natives predicts mixed signals in money and finance because of the position of Saturn. In the latter part of the year you will make profits and clear debts. Simultaneously your expenses will soar beyond limits. Try to control your spending so that you don’t run into debts. 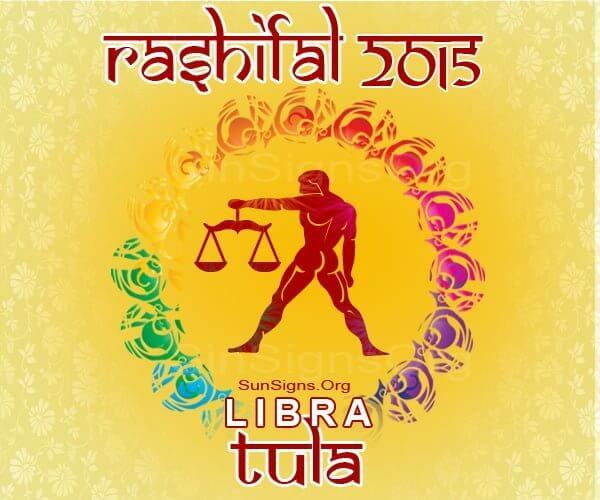 The Tula Rashifal 2015 predicts that the second half of the year is suitable for getting into new relationships. Personal life will be pleasant and enjoyable. You might even find your right partner this year. Family life will be harmonious for the Tula Rashi except for a few minor hiccups. Children and pregnant women may face some difficulties during the year. A chance of some tragic event in the family is likely show the Thula Rasi 2015 predictions. It is a good idea to go on a vacation to the beach or the mountains with your family and friends. Work related travel too will yield good results. Health will be normally good according to the 2015 Tula Rashi astrology predictions. The second half of the year may pose some hardships due to planetary positions.